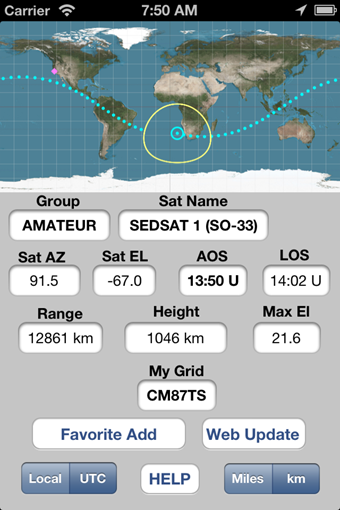 'Satellite Explorer Pro' is a free app for the iPhone, iPad and iPod Touch that is available through the iTunes app store. 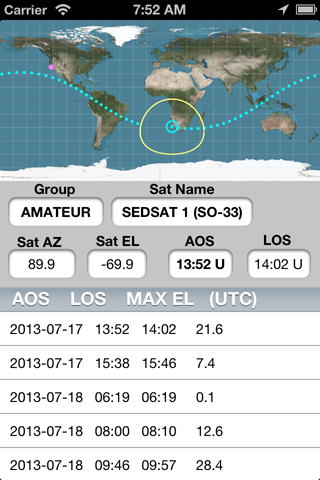 This app is a tool for tracking satellites. It is not a game. In addition to reading the information on this web site be sure to watch the following videos that demonstrates basic operation of the app and the new features added in version 1.1. The iPhone screenshot below shows the main program screen. The tracking map shows the current location as a red diamond and the satellite track as a series of blue dots. The dots are spaced apart equally in time. The satellite location is shown as a blue circle with a blue dot in the middle at the start of the track. The satellite coverage circle is shown as yellow circle. This iPhone screenshot shows the list of groups that is displayed when the 'Group' textbox is tapped. 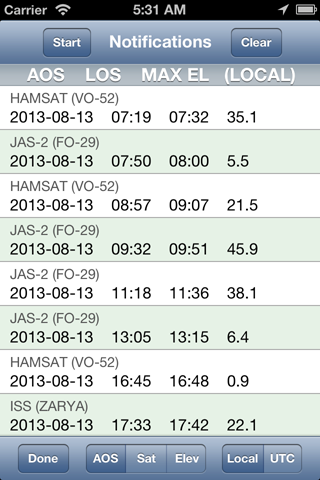 It is a scrolling list so you can swipe the list to see more satellites. Tap on the desired group name to select it or tap on the 'Group' textbox again to dismiss the list. 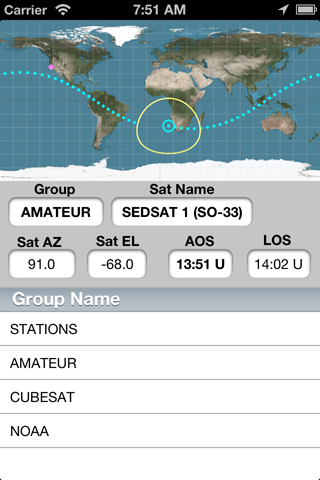 This iPhone screenshot shows the list of satellite names that is displayed when the 'Sat Name' textbox is tapped. 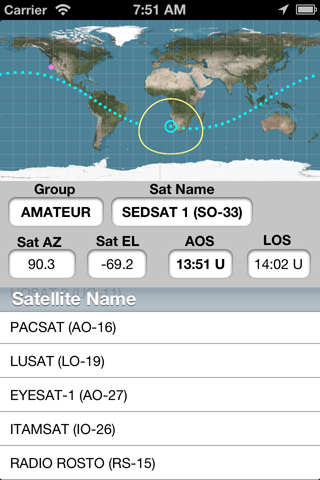 It is a scrolling list so you can swipe the list to see more satellites. Tap on the desired group name to select it or tap on the 'Group' textbox again to dismiss the list. This screenshot shows the list of upcoming in-range passes that is displayed when the 'AOS' textbox is tapped. 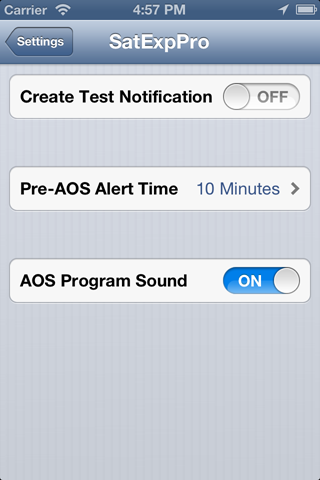 Tap the 'AOS' textbox again to dismiss the list. This screenshot shows the 'My Location' screen that appears when the 'My Grid' textbox on the main screen is tapped. 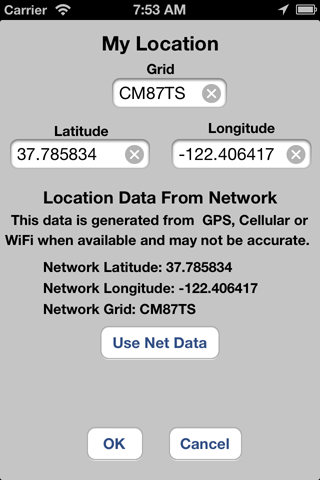 This screen allows entry of your current location using Latitude-Longitude, Grid Locator or autolocation using the location circuitry in your device. While on the 'My Location' screen you may tap on the 'Latitude', 'Longitude' or 'Grid' text boxes to bring up the on-screen keyboard. When you have changed a value tap on the 'return' key or tap on any unused space on the screen to dismiss the keyboard. Tap on the 'Use Net Data' button to use the autolocation values. Tap on the 'OK' button at the bottom of the screen if you wish to use your new values or the 'Cancel' button\to cancel the change and return back to the main screen . Tapping on the 'LOS' text box on the main screen will bring up the 'Predict' window as shown in the screenshot below. Pass information for the satellites in your 'Favorites' group is displayed for approximately the next 24 hours. Watch the v1.1 New Features Video and read the 'Help' in the app for more information. The 'AOS Sat Elev' segmented control shown at the bottom of the screenshot allows the pass list to be sorted by 'AOS' which is the default, 'Sat' (satellite name) or 'Elev' (maximum elevation). This control was added in the v1.11 update. The screen shot below shows a local notification created by the app. If you are not familiar with notifications on your iDevice be sure to study the topic. This app plays a very small part in the whole notification system. The iOS Notification Center does most of the work. Watch the 'v1.1 New Features Video' and read the 'Help' in the app for more information. The screenshot below shows the Settings Screen for the app. This screen is accessed from the iOS Settings that is used for all the apps on your iDevice that use settings. Be sure to watch the v1.1 New Features Video and read the 'Help' in the app for more information..
Q: Where does the TLE data come from. Q: Does the predict page data auto update. A: Due to the performance limitations on small devices it does not. To update leave the predict page with the done button and then re-enter it. 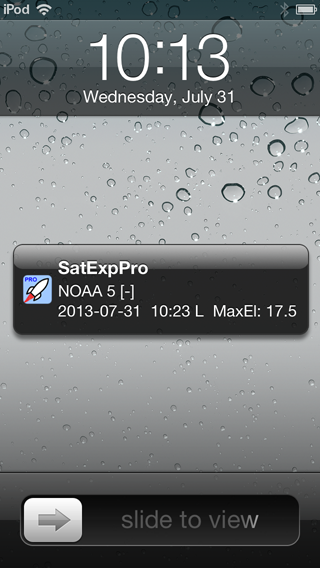 No personal, phone or contact information is collected, used or shared in any way by the 'Satellite Explorer Pro' app.